What is Platelet Rich Plasma Therapy [PRP]? 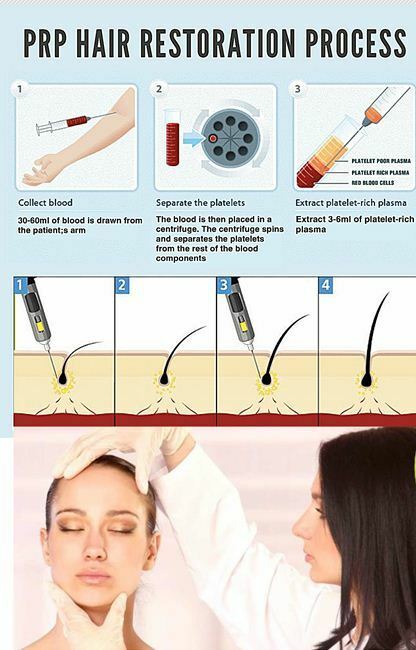 With a thin needle, your own Platelet-Rich Plasma (PRP) is injected into the scalp [Bald area]. Then the growth factors in your blood cells do their job and hair growth is Naturally stimulated. Human blood plasma (PRP) contains active growth factors which can promote hair growth. Helping to restore one’s confidence, the end result is a fuller, healthier looking head of hair. The cost of PRP hair treatment depends on number of sessions needed to obtain the desired result. Physicians started using PRP therapy about two decades ago to speed up the healing process in damaged joints after injury or surgery. During the treatment, a technician draws your blood and spins it in a centrifuge to separate out the platelets and plasma. Doctors then inject the plasma, which helps repair blood vessels, promote cell growth and wound healing, and stimulate collagen production. Doctors have used PRP in dermatology after researchers found that high concentrations of platelets in plasma cells help promote hair growth by prolonging the growing phase of the hair cycle. Doctors inject plasma into the scalp where hair loss has occurred. They typically administer injections monthly for three months, then spread them out over about three or four months and also can take more time in some cases. The injection schedule will depend on patient’s genetics, pattern and amount of hair loss, age and hormones. Doctors typically recommend hair transplantation only for those who have dramatic hair loss. Transplant is also more costly and leaves scars since it involves surgical treatments. Instead, doctors can perform PRP therapy prior to transplantation, which can provide better results with more dense hair growth. In a 2014 study, researchers in India looked at men with male-pattern baldness that used approved medications, but saw little change in their hair growth. After four PRP treatments, they had about 30 percent more growth in thinning areas. A study conducted at Italy in 2017 tells, male patients had increased hair and density in areas where doctors used PRP therapy. Studies reveal that, it takes about three months to see an improvement. After that time, most of the patients (male and female) have re-grown 30 to 40% of the hair they have lost. What makes you a good candidate for PRP therapy? If you have an underlying disorder such as thyroid disease or lupus, you aren’t likely to have good results because these conditions will continue to cause hair loss over time. If you are on blood thinners, your platelets won’t work as effectively and the procedure is not as effective. PRP therapy works better if your hair loss is recent. It is more challenging if your hair loss has years history where hair follicles have been dormant for a long time.